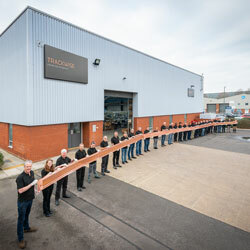 Trackwise has shipped a 26m long multilayer, FPC, believed to be world’s longest ever produced, for distributing power and control signals over the wings of a solar-powered UAV. The circuit is one of over 50 supplied by the company for this vehicle. The complete interconnect system of the vehicle is made of FPCs representing an approximate total systems weight saving of 60% over traditional wire harness. This will allow the UAV to deliver higher payload and/or improved speed and range. The FPCs are constructed using IHT, a patented, reel-to-reel manufacturing method. Conventional FPCs are seldom more than 2m in length, essentially due to limitations of manufacturing processes. IHT overcomes these limitations, allowing FPCs of unlimited length to be produced. The UAV’s flexible circuit is based on a polyimide substrate. The planar structure of the circuit dissipates heat better than traditional wiring, allowing higher current carrying ability for a given weight of copper conductor. Printed manufacturing assures circuit consistency, fewer connection points are required so reliability is improved, and the FPC is simpler to install than wire harnesses, decreasing a vehicle’s assembly time and cost.